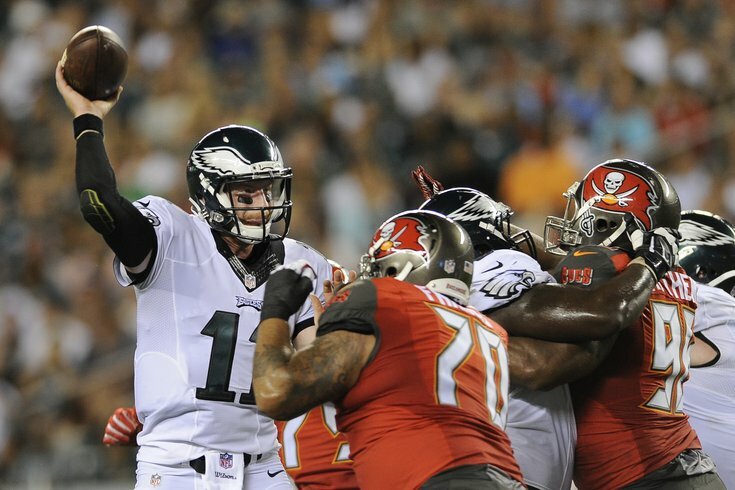 Philadelphia Eagles quarterback Carson Wentz is pressured by Tampa Bay Buccaneers defensive tackles A.J. Francis (70) and Cliff Matthews (96). We saw the good, the bad and the ugly from the Eagles quarterbacks on Thursday night as the Doug Pederson era – and the 2016 NFL preseason – officially got underway at Lincoln Financial Field. And just based on what we witnessed from the top three quarterbacks, the ones expected to be on the roster, it would appear there's something terribly wrong with the rookie head coach's depth chart. As it currently stands, Sam Bradford is the starter, Chase Daniel is the backup, and Carson Wentz is the third-string QB who won't be active on Sundays this fall. But if you watched any significant portion of the Eagles preseason opener against the Tampa Bay Buccaneers, a 17-9 win for the home team, it became pretty obvious that Wentz is better than Daniel. Take a look at their stats, which I'll admit don't tell the whole story, but are a mandatory starting point for any discussion such as this. *Daniel scored a 3-yard rushing touchdown on his second drive. It's true that neither stat line is good, but Daniel was just awful – especially considering he's the guy most familiar with Pederson's scheme after playing for under him in Kansas City. Furthermore, Daniel was repeatedly sacked and seemed unable to avoid pressure as his depleted offensive line struggled to stop just about anything. "It was tough. It was a tough situation for him," Pederson said after the game. "There wasn't a ton of time back there to throw the ball but he was able to move the team a little bit with the run game. It's just hard to get in the rhythm as a quarterback when things aren't stable. ... But for the most part, he came out healthy and we have another opportunity next week to get this thing better." He didn't get hurt is not really a ringing endorsement. That was not the case for Wentz. He moved better in the pocket. He made, for the most part, better decisions. And, in the end, he showed everyone watching why he deserves to be, at the very least, the Eagles backup quarterback. Essentially, Wentz could be the odd man out to start the season, but if Bradford goes down with an injury during a game, it wouldn't be surprising to see the rookie start the following week despite Daniel finishing up the game in which Bradford started before getting hurt. The main duty of a backup quarterback is filling in when the starter goes down with an injury. Pederson is a former QB -- and a longtime backup at that -- meaning he understands more than most coaches the psychology of playing that position. Wentz has never played an NFL game before -- not counting his two quarters Thursday night against a bunch of guys who likely won't be in the league come Week 1. His first regular-season action should come when he's had at least a full week to prepare both mentally and physically (i.e. practicing with the first team). Throwing him to wolves mid-game without enough time to prepare would be a disservice to the No. 2-overall pick. As for his preseason debut, Wentz should be feeling pretty good about himself, even if he's still a little sore from the hit he took on the final play of the game. "I thought some plays were made, but I thought there were some that still needed to be made that were left on the field," Wentz said of his performance. "The interception in the red zone, that's something you never want to do. That ball sailed on me, got away from me. Overall, there's a lot of good things to build on and we're walking away with a win, so that's what's most important." Perhaps his best drive of the night was also his worst. After moving the Eagles down the field on his third series, Wentz overthrew Patrick Turner deep in the red zone and was intercepted. "[That drive] ended unfortunately," Pederson said of the drive. "He had the early pressure and the ball sailed high. But the fact that he got the team down there [is good] and it was all things that are fixable, all things that are correctable. For a young quarterback, it was a tremendous opportunity to get that many snaps and we have another week to fix it." Before the interception, however, we got to see more than a few good things from the rookie, including three consecutive completions (a combined 33 yards). But the most impressive play from Wentz on Thursday night was, of all things, a busted play that began with a fumble and ended with an incomplete pass. What happened between, however, said a lot about the quarterback's ability to avoid pressure, improvise and, most importantly, make the smart decision. After a low snap went between Wentz's legs, he was able to turn around and run 10 yards behind him to scoop it up. He then avoided the defender barreling down on him and after checking to see if anyone was open, wisely threw the ball out of bounds. "I was just hoping I'd pick it up cleanly," Wentz said. "I turned around to see what's happening and had a big guy running right in my face and I just got us back to the line of scrimmage by throwing it away." It's just one example of how Wentz was able to avoid being sacked all night, unlike Daniel, was brought down four times. "Some of those [runs] were nakeds, designed plays and some were just improvising," Wentz said. "I feel confident on the move, and that was something we wanted to get on tape. I thought we had some good plays off the naked." And even when he wasn't using his legs to avoid pressure, he was able to outsmart it. On a corner blitz during that same drive, the rookie was able to pick up the rush and without hesitation hit the receiver left open by the blitz. As a coach, that's what you want to see out of a rookie quarterback. "He made a couple tough runs for us, which we needed," Pederson added. "And then completed the ball where it needed to be. By no means was he, or anybody, perfect tonight, but I was pleased for his first outing and we just need to continue to work with him to get him where he needs to be." Still, Wentz took plenty of hits, including a couple scary ones. And his coach liked how he responded. "I love his toughness. You saw some of the shots he took tonight and stood in the pocket and bounced back from some tough hits," Pederson added. "He was able to move the team and got the three points, but I was hoping to get him in the end zone and let him taste what a touchdown feels like at the NFL level. But I was pleased overall with what he did -- we have to clean up some things like we do in a lot of areas." "I loved it," Pederson added. "I wish he would've hurdled the guy." "I was just hoping I didn't land on my neck," Wentz said. And as for those "We want Wentz" chants before he was put into the game? "Someone mentioned it to me, but I didn't really hear it much," he said. "I just know that the fans are excited and I know it's going to be a heck of a ride here and I'm looking forward to it."